With each month growing in scope and intensity, here’s one of our most thrill-packed yet. Once again, it’s our blessing to bring you this in-the-round music and performance event – the best thing about it is the people. Staring wildly into the blackness beyond stage lights, roaring about a train, Charles Hayward mesmerised at the Barbican recently, evoking our favourite combination of hilarity and ominous woe, as he stepped swiftly over the wreckage of complacence and into our souls. “A sequence of betrayal, paranoia, subterfuge, opening out into resistance, hope and humanity” is presented on voice, piano and other objects by this legend of experimental rock music and champion of creative progress in general. It’s our thrill and privilege to be humble party to your experiencing this work. With tunes created in isolation in a Paris studio, the synth-expert at the heart of the triumphant The Comet is Coming sound-explosion summons his irresistible command of melody, momentum and audio spectacle for a rare solo performance, for us. Somehow central in the progress of so many new groups, while touring two original bands, this individual has meanwhile created solo material that is expansive, challenging and devoted to invention. His abundant generosity has him descending on our gathering for a debut of this unreleased material. Alabaster’s band this month includes Danalogue (keys), Rozi Plain (bass), and Will Calderbank (cello), with all members singing counter-melodies. The saxophonist and spoken-word artist responsible for this monthly event brings stirring instrumental passages countered by words and behaviour that are frank and ruthless, but also genuine, kind and welcoming. The creative demands and emotional challenges are themselves just two reasons, for performing each month with a new group of players, with fresh material. 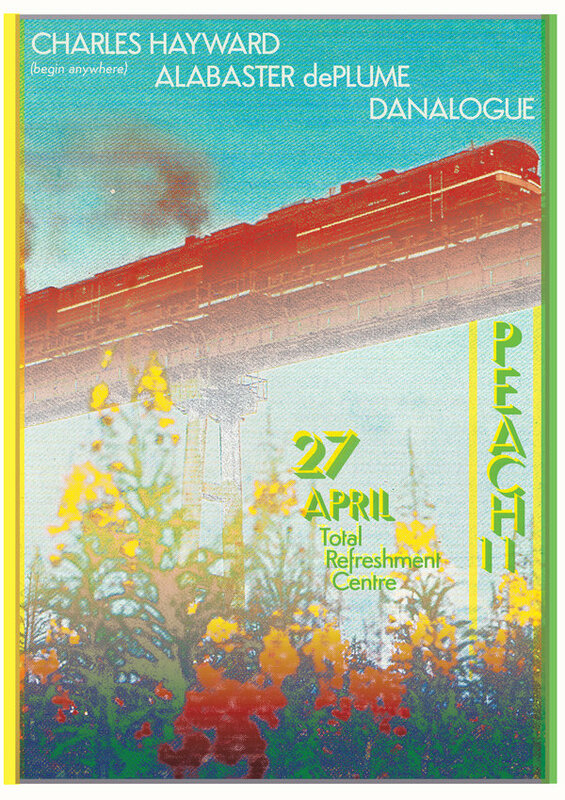 RAIMUND WONG creates the images that represent each Peach concert, contributes to the curation and will also be providing the tunes in-between performances this month. LEXUS BLONDIN is involved in the curation of the show and provides lighting and vibe. THE TOTAL REFRESHMENT CENTRE's community makes this show possible in the first place, and we deeply encourage you to find and engage with it – it is excellent.